Edward Philips Thompson, Esq., J.P. 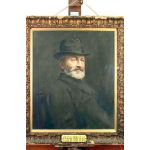 Early C20th portrait painting of Edward Philips Thompson, Esq. J.P. by Frank T Copnell. Late seventeenth century portrait painting in oil of Charles II (1630-1685) by unknown artist. Nineteenth century oil painting portrait of an unidentified boy with straw hat, artist unknown. Colonel Viscount Rowland Hill (1800-1875). Early nineteenth century portrait oil painting of Robert W. Darwin (1766-1848) by W.W. Ouless. Late 19th century oil painting portrait of Alderman Thomas Southam, 1880 by W.W. Ouless. Late 17th century oil painting portrait of Admiral John Benbow, artist unknown.